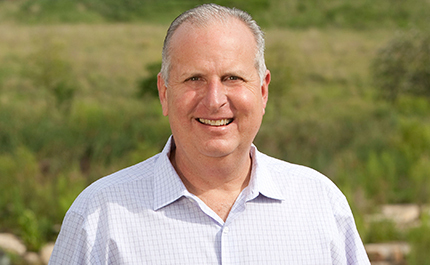 Development in flood-prone areas always poses a challenge, but Austin-based Castle Hill Partners is turning this site constraint into a real asset for Trinity Falls, a new master planned community located in McKinney, Texas just north of the Dallas-Ft. Worth Metroplex. 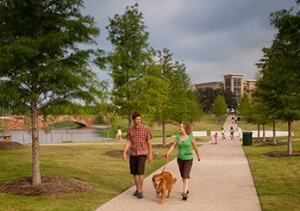 The 1,708-acre community is situated along the East Fork of the Trinity River, which runs the entire length of the site’s eastern edge. 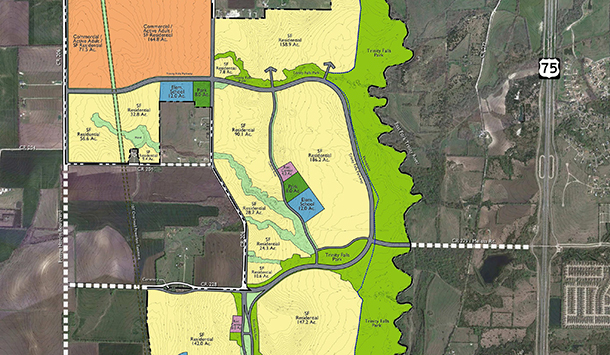 Backed by a generous $11 Million endowment from the BB Owen Trust, Trinity Falls will reclaim the floodplain area to create a 300-acre park system unrivaled by any other master planned community in the market. Amenities planned for the park include miles of nature and interpretive trails as well as hike and bike facilities, an amphitheater, multiple playgrounds, picnic areas, and large athletic fields. RVi will also work with civil engineer Kimley-Horn to create a series of stormwater management ponds that will double as recreational lakes for fishing and boating. RVi has been working with Castle Hill Partners on the community since early 2012. Phase I includes 142 acres of single-family residential, a 3-acre recreation center, and the first phase of Trinity Falls Park. At full build out the community will feature approximately 4,200 home sites, three elementary schools, and extensive amenities throughout including a commercial component. 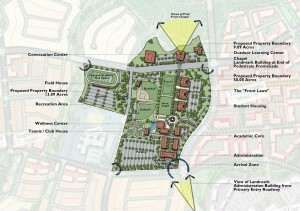 The design concepts for the community reflect its natural setting, with curvilinear forms and a native plant palette. Castle Hill Partners broke ground on the community in early August, and anticipates the first homes to be available starting mid-2014.